QUETTA/NOWSHERA: At least six terrorists were killed in two separate attacks on security forces on Thursday in Quetta and Nowshera after a “high-value target” of the Lashkar-e-Jhangvi (LeJ) was killed on Wednesday night in Balochistan’s Kili Almas in an operation by security forces that also resulted in the martyrdom of Military Intelligence’s Col Sohail Abid and Head Constable Sanaullah, who succumbed to his injuries on Thursday evening. The attacks also resulted in at least 20 people getting injured, including security officials. The key terrorist was involved in the killings of over 100 members of the Hazara community as well as police personnel, the military’s media wing reported. As per the details, six people including four security personnel were injured in an attempt to attack the Frontier Corps (FC) Help Centre in Quetta on Thursday night. “Vigilant FC soldiers fired at the terrorists and stopped their entry,” ISPR said in a statement and added that all five attackers were killed by the security forces in an exchange of fire. “Situation under control, four FC soldiers injured in exchange of fire in Survey 31 area near Chaman Housing Society,” said ISPR, adding that the bomb disposal team was advancing on the site of the terrorist attack to conduct neutralising, search and sweep operations as per the SOPs. While there was no immediate claim of responsibility for the attack, the military’s media wing said that the attackers were suspected to be Afghan nationals. “The failed attempt was a response to the killing of their key terrorists last night in Kili Almas,” ISPR added. 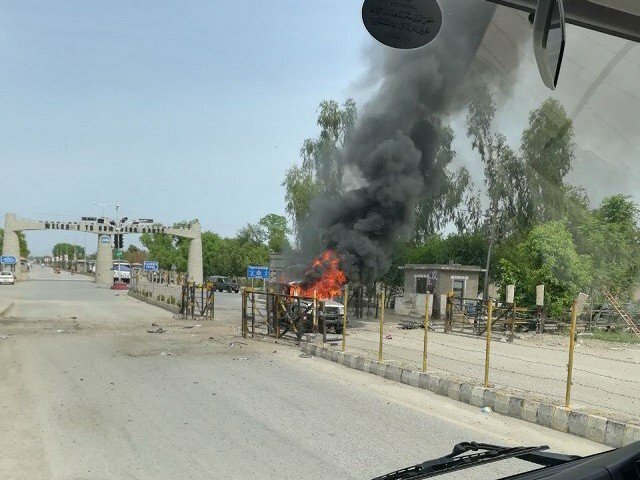 Meanwhile, emergency and rescue teams were dispatched to the site of the attack, following which an emergency was imposed in the hospitals of Quetta. Earlier, Balochistan Home Minister Sarfraz Bugti confirmed that FC Madadgar Centre came under attack and multiple blasts and gunfire were heard in the vicinity. Following the abortive attack, Punjab Inspector General of Police (IGP) Arif Nawaz issued the orders to field officers including CCPO, RPOs and DPOs to beef up the security across Punjab in a bid to avoid any untoward situation. It is pertinent to note that the operation on Wednesday night had taken place when security forces intercepted and killed a terrorist leader of the Lashkar-e-Jhangvi (LeJ). “Security forces conducted an intelligence-based operation in Killi Almas area of Balochistan on pointation from apprehended high-value target about the presence of suicide bombers along with other terrorists in hideouts,” ISPR reported. According to the statement, three terrorists — two suicide bombers and one high-value target identified as Salman Badeni — were killed after an intense gun battle. The two suicide bombers were of Afghani nationality, ISPR said. One injured militant is in the custody. A combing operation is ongoing in the area. On Thursday afternoon, one person was killed and 14 others injured when a suicide bomber rammed his bike into a Frontier Constabulary (FC) vehicle on Nowshera’s Mall Road near Kachehri Chowk. According to details, 12 of the 14 injured were shifted to Combined Military Hospital, Nowshera while the other two were taken to the DHQ Hospital. The condition of four injured however was stated to be critical. District Police Officer Shahzad Nadeem Bukhari told reporters that the FC vehicle was on the way to Peshawar from Rawalpindi with six personnel, including an officer, when it was targeted. The attack had destroyed the vehicle and leaving all the passengers injured. The JuA claimed that the attack is part of operation Ibn Qasim and more attacks will be carried out such as this in the future. 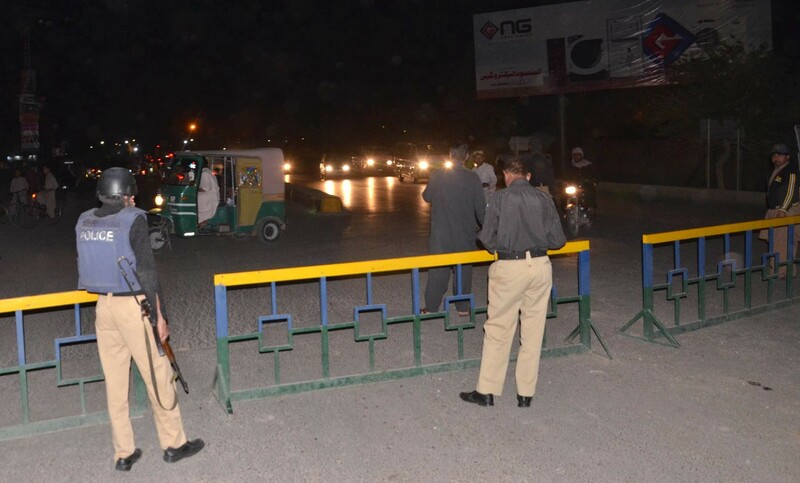 Following the attack, security measures have been tightened throughout the province. Earlier, Khyber Pakhtunkhwa Inspector General of Police Salahuddin Mehsud had declared the security schedule and strategy for the holy month of Ramzan. It was also reported that there was a high-security alert throughout the province and other parts of the country. The funeral prayer of Colonel Sohail Abid of Military Intelligence, who embraced martyrdom on Wednesday during an operation near Killi Almas, Balochistan, was held in Rawalpindi on Thursday, and he was laid to rest at Bobari near Bara Kahu with full military honours. Col Sohail Abid of Military Intelligence was martyred in the gunfight while four other soldiers were injured, out of whom Head Constable Sanaullah succumbed to his injuries on Thursday evening. 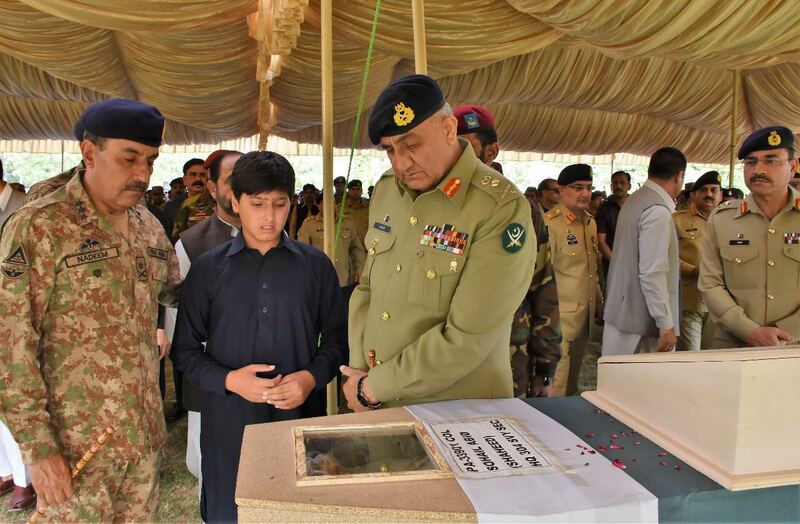 Chief of Army Staff General Qamar Javed Bajwa and a large number of senior military officers, soldiers and relatives of the martyred soldier attended the funeral prayer. “When a soldier sacrifices his life I lose part flesh of my body, that night is always difficult to pass. But we remain fully determined to sacrifice anything and everything for the defence of our motherland,” the Inter-Services Public Relations (ISPR) said quoting COAS in a tweet. Speaking to reporters, slain colonel’s father said that he was proud of his son who sacrificed his life for the country. Meanwhile, Prime Minister Shahid Khaqan Abbasi, Punjab Chief Minister Shehbaz Sharif, National Assembly Speaker Ayaz Sadiq, former president Asif Ali Zardari and Pakistan Tehreek-e-Insaf (PTI) Chairman Imran Khan paid rich tributes to the martyred officer. PM Abbasi stated that Pakistan’s valiant forces will not rest till the last traces of terrorist elements are wiped out from Pakistani soil. “Our soldiers have paid the price of freedom with blood and there is no higher sacrifice than it. We as a nation are united than ever against the coward enemy,” the PM said. LeJ, a group which subscribes to the hardline Takfiri Deobandi school of Islam, considers Shias apostates and has carried out scores of bloody bomb and gun attacks in Balochistan over the past two decades, most of them aimed at the Shi’ite Hazara community. Earlier this month, members of the Hazara community went on a hunger strike in Quetta to protest a recent spate of killings targeting them and to demand greater protection in the resource-rich province that has been plagued by violence and insurgency. The Hazaras called off the protest after meeting with Pakistan’s powerful army chief General Qamar Javed Bajwa, who vowed greater protection and promised those targeting Hazaras “shall suffer twice as much”.